What's worse, the report's author warned that voluntary efforts to change the world's eating habits would fail so he "urged the government to use caps on greenhouse gas emissions and carbon pricing to ensure changes were made." In other words, he's calling for food police to force you, me, and everybody else to eat what he and his pals think we should eat . . . all to save the planet from myth of global warming. Back when he hosted a nightly talk show on KMOX, local legend Jim White used to say, "save me from the good people." Right now I say . . . save me from the crazy, vegetarian, would-be do-gooder, socialist, global warming nuts. And bring me a t-bone, medium-rare. 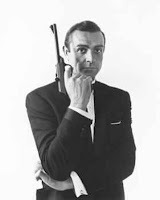 Apparently Joe Biden wants to paint himself as an action hero - James Bond on a fact-finding mission. Should we call him Double Oh Joe? The issue is incredibly complex and most of us simply don't have the facts or economic expertise to know what must be done and when to salvage the American economy. I won't pretend here - or anywhere else - that I know the right answer to this apparent crisis . . . but taxpayers bailing out lenders who made bad decisions and lent money to folks who can't pay it back certainly has a stench about it. Why shouldn't bad businesses be allowed to go under? And just as important, where are we going to get a fresh $700 billion or so to pay for this? I don't believe that the government's got the money. Are they just going to borrow it from the Chinese or print more of it, devaluing the currency? Or are you and I going to be asked to buck up and pay higher and higher taxes since Fannie Mae, Freddie Mac and their friends were irresponsible? A friend of mine at lunch today made a good analogy to this situation . . . it is like a child asking a parent to take him to Disneyworld. "Sorry," says the responsible parent, "we just can't afford to go right now." "That's okay," says the child, "just write a check." 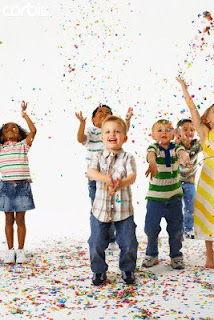 Are most of our national leaders as naive as the child in the story? Or do the rest of us just not understand? The job of leaders is to lead. That hasn't happened yet. If this bailout is really necessary then George Bush, Nancy Pelosi, Barney Frank, and the rest of its supporters need to make a stronger case and convince America. Make your case for this bailout or come up with a new, responsible plan. 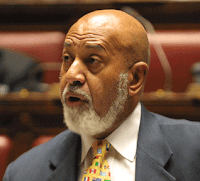 Last week Florida Democrat Alcee Hastings ranted (or should I say rambled?) against Sarah Palin calling her a gun-toting moose-stripper who "don't care too much about what [she does] with Jews and blacks." Today he apologized. He added that his comments "were not smart and certainly not relevant to hunters or sportsmen." For a change Congressman Hastings, I agree with you. It took me most of the weekend to watch most of Friday's debate on my DVR. Not surprisingly, it ran over the allotted time so I suppose it is possible that something exciting happened after my recording cut off . . . but I doubt it. Neither John McCain nor Barack Obama excelled. Neither looked presidential. And neither explained a single position with more detail or insight than a typical stump speech or talking point. On the other hand, neither candidate made a huge gaffe, so likely both are claiming victory. The format flopped. Despite Jim Lehrer's efforts to get the candidates to address each other directly, they didn't. Neither seemed to have been briefed on or okayed the plan. Certainly neither was ready to interact directly with the other. And, most galling to me, neither McCain nor Obama answered a single question directly. Maybe it is naive to expect more from these guys in this context - but I did. I do wish that there was another viable choice in November. Saint Louis Conservative's favorite* lunatic dictator, Venezuela's Hugo Chavez, is at it again. Now, he's chimed in with advice to America on how to deal with the current financial crisis. He's "helpfully" suggested that we drop our Constitution because it is "capitalism that caused the ruin." 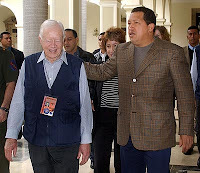 Capitalism and the freedoms guaranteed by our current Constitution, Mr. Chavez, form the foundation of what has made the United States of America the greatest nation on the planet. So, here's my free advice to you . . . "shut the ____ up." *Two other contenders for "favorite lunatic dictator" come to mind but both were disqualified. Mahmoud Ahmadinejad in Iran is certainly a lunatic but he answers to "Supreme Leader" Ali Khamenei and, therefore, doesn't qualify as a dictator. And nobody's really sure that North Korea's Kim Jong-il is still alive. Amidst all the troubling news out there today comes this story of triumph and hope . . . stem cell researchers at Harvard University have reported discovery of "a safe way to coax adult cells to regress into an embryonic state." These cells are "indistinguishable from embryonic stem cells and could be transformed into any type of tissue." Last year, scientists made a similar breakthrough but concerns were raised that the technique used left traces of potentially harmful retroviruses in the cells. Those concerns have now been eliminated. Also eliminated with those concerns are any arguments in favor of harvesting stem cells from aborted babies for use in research. 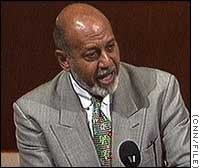 ABC News reports that Congressman Alcee Hastings (D-Florida), a member of the Congressional Black Caucus, participating in a panel discussion sponsored by the National Jewish Democratic Council said, "If Sarah Palin isn't enough of a reason for you to get over whatever your problem is with Barack Obama, then you damn well had better pay attention . . . Anybody toting guns and stripping moose don't care too much about what they do with Jews and blacks. So you just think this through." Leadership or Overreaction? . . . Rationality or Selfishness? Both of these candidates (and Joe Biden for that matter) are elected representatives serving in the U.S. Senate. Since they haven't resigned to run for president, shouldn't they be continuing to do their jobs as senators as the race proceeds? Especially when crisis seems to be looming? McCain going back to Washington to focus on the task at hand shows character and leadership. What is most important to him right now is working toward fixing the current economic mess - not running for president. That says something about him. At first blush, I thought that this move was overreaction, but I think that it might actually be a sign of leadership. If historical issues are being considered in the U.S. Congress, U.S. senators should be devoting their attention to those issues instead of cramming for a debate like it was history test. But Obama said no. He'll keep on cramming and plans to show up for the debate even if McCain won't be coming. Is this the rational move? I mean, Obama's priority is winning the White House and falling in line behind McCain's bold move wouldn't look very presidential. And taking time to study will probably help his presentation. But on the other hand, Obama is a senator. His refusal could simply be selfishness. How this all plays out should be interesting. 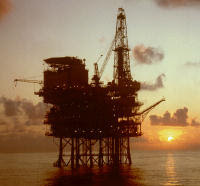 David Obey, the Democrat who chairs the House Appropriations Committee, admitted defeat today and said that the provision continuing a ban on offshore oil drilling will will be dropped and the ban will be allowed to expire. I suppose that the Democrats finally realized that utilization of American resources in the face of a global energy crisis might make sense after all. Kudos to the Republicans in the House of Representatives for keeping the issue alive . . . and winning the fight! The elephant in the room for the past several days has been the nation's financial situation. You haven't read much about it here. Here's why - I'm not sure what to make of it. The situation seems dire but bailing out bad investments certainly seems like "financial socialism" and a very bad idea. But I don't have enough information to know whether or not we're so deep in the doo-doo that we have no choice. It is times like this that we should all realize that we elect leaders to lead our nation through crises. Real leaders aren't worried about poll numbers or legacy building. Instead they analyze situations (where they have more information than we do) and guide us down the chosen course. And that's why character and integrity matter in the upcoming presidential election. Which of the two candidates do you want steering the ship through troubling times? And who do you think has the ability, courage, wherewithal, and fortitude to face up to this and whatever future crisis might arise? The answer is clear. The man for the job is John McCain. A poll released today by the St. Louis Post-Dispatch showed Republican Kenny Hulshof gaining on Democrat Jay Nixon in the race for governor. In the previous P-D poll taken in July (while the family squabble with Sarah Steelman still raged on) Nixon had a seventeen point lead. Now it is only seven points, 50%-43%. And there's a 3.5% margin for error. Tuesday is six weeks before election day. There's still time for Hulshof to salvage the race. Farther down the ballot, there's a mixed bag for the GOP. Peter Kinder has a big lead for reelection as lieutenant governor and Brad Lager has an 8 point lead in the race for treasurer. But Benedict Arnold (a.k.a. Chris Koster) leads Mike Gibbons 46% to 40% in the attorney general's race and Robin Carnahan leads Brad Lager by eleven. Again, Tuesday - tomorrow - is six weeks before election day. With the presidential ticket of John McCain and Sarah Palin energizing the Republican base, November 4, 2008, could be a good day for Missouri after all . . . but we're a long way and a lot of hard work away from victory right now. Back in March, Hillary Clinton told her whopper about her harrowing trip to Bosnia, "landing under sniper fire." And we all know what that did for her political career. Now, it seems, that the Democrats' V.P. candidate, Joe Biden, is learning the art of exaggeration from Hillary. He's apparently out on the campaign trail talking about searching for Osama bin Laden in Afghanistan "where [his] helicopter was forced down." 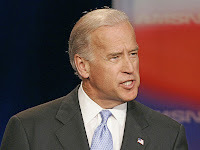 Joe Topper blogging at abcnews.com checked out Biden's tall tale - or, should I say, subtle stretching of the truth. 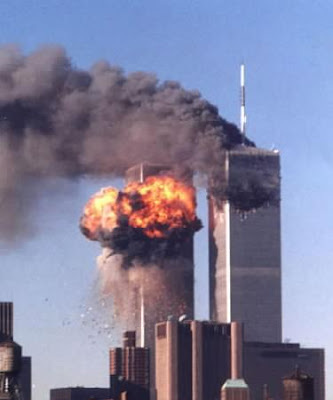 There was a helicopter carrying Biden, John Kerry, and Chuck Hagel. It did make an emergency landing in Afghanistan. But it wasn't forced down by terrorists, as Biden certainly is implying, but by a snowstorm. The And Now Things Get Serious Department has, unfortunately, become a daily feature. Today's feature . 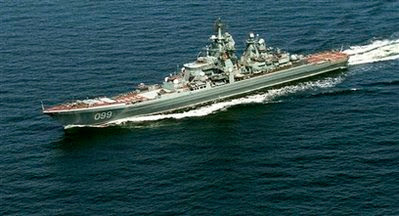 . . Russia is sending a squadron headed by the nuclear-powered cruiser, Peter the Great (and its 20 nuclear cruise missiles and 500 surface-to-air missiles) to participate in joint naval exercises with Venezuela in the Caribbean. A little close to home, don't you think? 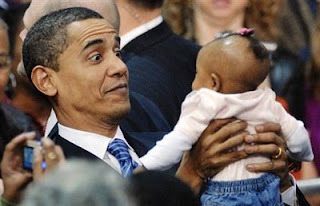 And, does anybody really think that Barack Obama is more ready to deal with situations like this than John McCain? Personally, I know that John McCain's pick of Sarah Palin as his running mate energized and gave me hope for the November election. When once I was debating the merits of staying home and looking forward to the hopeful rebirth of a conservative GOP after the seemingly-assured, resounding defeat of "moderate," now I'll be in line at the polls bright and early, with bells on. But things have changed . . . 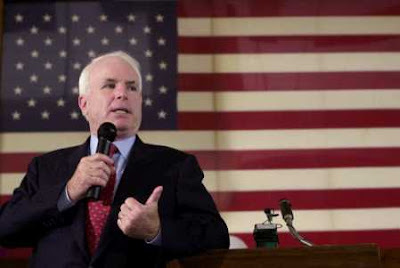 In July, according to a St. Louis Post-Dispatch poll, McCain trailed Barack Obama in Missouri 48% to 43%. Since then, McCain has climbed 6 points and taken the lead over Obama, 49% to 45%. Palin is now drawing Obama-esque crowds, 60, 000 people turned out to see her in Florida today. The upcoming debates will, I think, be the deciding factor in what seems to be shaping itself into another close election race. And, for the first time in many years, the debate between the Vice Presidential candidates (October 2, 2008, at Washington University in our town) is likely to matter as much or more than any of the three Presidential debates. 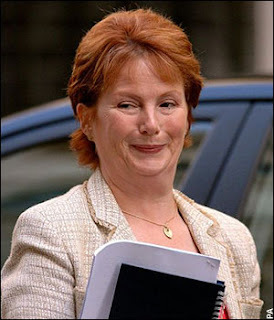 Again from the Big Fat Who Cares Department, Britain's Communities Secretary, Hazel Blears, has denounced Sarah Palin's politics as "horrendous." Memo to Secretary Blears . . . Americans stopped giving a _________ about British opinion in 1776. 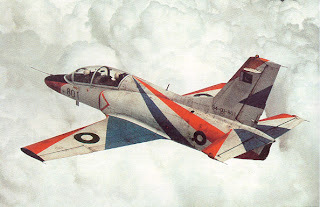 And from the And Now Things Get Serious Department, Venezuelan dictator Hugo Chavez has announce plans to purchase combat aircraft from China. And now things get serious . . .
the Russians are planning to sell missile defense systems to Iran and Venezuela. (Story here). Today's St. Louis Post-Dispatch reported today on an attempted armed robbery of a City bar foiled by a gun-wielding bartender Monday. When the criminals walked into the bar, pulled a handgun, and ordered everyone to hit the floor, the bartender pulled his own gun and fired, hitting one of the robbers, Demetric Harbin, twice in the rear. Harbin was arrested, but his compatriot escaped (you can't win them all). Criminals shouldn't be the only armed people in the world. 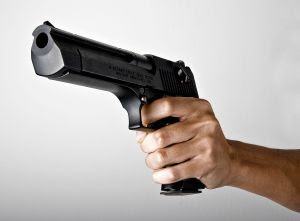 If gun control advocates had succeeded in eviscerating the Second Amendment, this robbery would likely have succeeded and who knows what else might have happened. It is also fortunate that neither Harbin nor his fellow robber was smart enough to determine what kind of bar they intended to victimize . . . the bar, Pooh's Corner, just happens to be a hangout for off-duty and retired police officers, like the unnamed bartender hero. I found this photo on the web. It is a cheap shot, I know, but I simply couldn't resist. If SHE's coming to your party, I'm not! 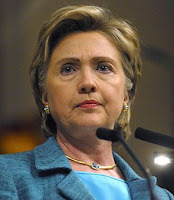 In a page taken right out of high school, Hillary Clinton has reneged on her promise to appear at a September 22 protest of Iranian President Mahmoud Ahmadinejad's appearance at the United Nations. Why? Because the protest's organizers also invited Sarah Palin to appear. Hillary's stated reasons seem shallow. As her spokesman put it, Palin's "attendance was news to us, and this was never billed to us as a partisan political event . . . Senator Clinton will therefore not be attending." Partisan?! How is it partisan if it features Democrat Clinton and Republican Palin? In reality, of course, the event isn't partisan at all. But to the Clintons, apparently, any appearance by a Republican in an election year is, by definition, partisan. 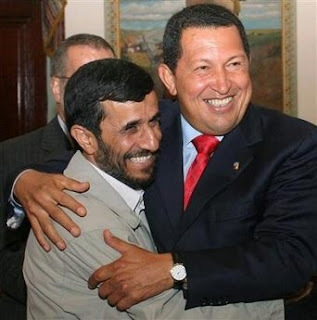 Ahmadinejad should be something Republicans and Democrats can agree on. 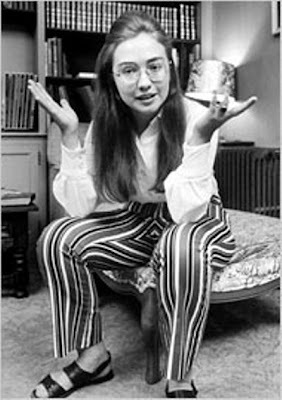 But Clinton is so upset by the mere presence of Palin - the new girl - that she's decided to stay home and pout. The race card has been thrown. Barack Obama has failed to put away John McCain and the race for the presidency is close. Could it be because Americans like McCain? Could it be that they approve of his choosing Sarah Palin as his running mate? Could it be that Obama's qualifications have been weighed by the American people and found wanting? Could it be because Americans are not ready for socialized medicine or the tax increases that promise to come with an Obama presidency? Could it be because Obama's position on the war in Iraq and opposition to the troop surge has proven wrong? 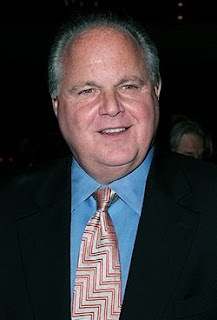 Could it be that America does not want a true-blue liberal as President of the United States? Heck no. That has nothing to do with it say the liberals themselves. Kansas Governor Katheen Sebelius is one example and CNN's Jack Cafferty is another case in point, who writes today on his blog that the tightness of the polls "doesn't make sense . . . unless its race." Sorry Jack, it makes a whole lot of sense unless you're a liberal yourself . . . and race has nothing to do with it. Many of us out here across America do not want a liberal to be president, black, white, or green. 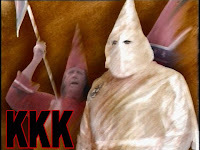 Just because we're backing McCain-Palin does not mean that we wear white robes and hoods or support the KKK. Accusations otherwise are offensive. The St. Louis Post-Dispatch cut into Sarah Palin with an editorial yesterday. No surprise really and not worth much commentary here - their take on Palin's interview with Charlie Gibson certainly differs from mine. But what more would you expect from the liberal P-D? But the editorial described the McCain-Palin campaign as one that is "built around image and distortion, not the reality of the candidates' qualifications or ideas." That sentence caused me to do a double-take. If there has ever been a candidate "built around image" it is Barack Obama. A man without qualifications who has no executive experience at all and just two years in the U.S. Senate. For Obama . . . image is everything. He has nothing else. A new advocacy group has begun running commercials critical of Barack Obama's refusal to support the Illinois Born Alive Infants Protection Act. The ad features the testimony of abortion survivor Gianna Jensen who, in her own words, "wouldn't be here" if "Obama had his way." The advocacy group is BornAliveTruth.org and the ad can be viewed at their website, here. The New York Post reported today that while Barack Obama is telling American voters that he wants American troops to come home from Iraq as soon as possible, he really wants them to stay in place - and be a campaign issue - until after the November elections. In fact, Obama "demanded" the delay in his discussions with Iraqi officials on his overseas trip this past summer. Thankfully, the Iraqis refused and, even now, are working with American officials on details of a withdrawal. If the job is finished and the Iraqis want us out, it is time to get out of Iraq. If the report is true (and I suspect it is, since the key source is an interview with the Iraqi Foreign Minister - not Matt Damon), it shows a despicable selfishness on Obama's part. But that shouldn't be a surprise, after all, he's a liberal and a politician. By my reckoning that puts him behind in the count 0-2 right off the bat. Vegetarians are "six times more likely to suffer brain shrinkage" than people who eat meat. This according to an Oxford University study reported today in The Times of India. Amazing isn't it . . . how research proves what ought to be obvious? Human beings are designed as omnivores. We have teeth (canines) designed to rip flesh. And now it turns out that doing that is good for us. Shocker! But I guess brain shrinkage could explain Dr. Rajendra Pachauri. The rest of the world wants Obama. We know. Matt Damon, Susan Sarandon, Pam Anderson, and George Clooney want Obama. We know that too. 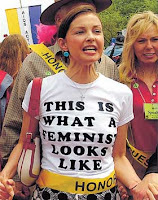 The latest celebrities noted on the Obama-wagon include Ashley Judd (that "vocal supporter of abortion rights") who Political Fix at the Post-Dispatch reports was "pitching-in" on phone banks around the state today before appearing at a "Women's Economic Policy" forum this evening in the Delmar Loop. Judd's support for Obama seems tame (and lucid) in comparison to Lindsay Lohan who posted a rant against Sarah Palin saying that she couldn't "bite [her] tongue anymore." Lohan says that Palin is probably not qualified to be more than a television news anchor. Just who do these celebrities think they are? Why are they given a forum to speak on politics? Is Lindsay Lohan qualified to determine who is and is not ready for the vice presidency? Qualified to vote, sure. But to lead opinion because she's an actress - not even close. So to all the Hollywood types out there telling us who to vote for in November . . . WHO CARES! Are the Democrats insensitive, unintelligent, or just not paying attention? First Joe Biden asks a state senator bound to a wheelchair to "stand up." Now the Obama campaign has launched a negative ad against John McCain for not sending e-mail. They're, of course, trying to portray him as out-of-touch with the modern world but they never thought to ask why he doesn't send e-mail . . . "he can't use a keyboard because of the relentless beatings he received from the Viet Cong in service to our country." Are Biden and Obama really as insensitive as they seem? I doubt it. Are they just not that smart? No, I think that they are intelligent but ignorant here. Are they not paying attention? I don't think they are. And shouldn't paying attention should be a prerequisite to the presidency or vice-presidency. "Abortion is the sacrament of the religion of liberalism." Even Big Media is on the Sarah Palin bandwagon . . .
ABC (formerly known as the All Barack Channel) announced today that Charles Gibson's interviews of Palin will "form the basis of a special prime-time edition of '20/20' Friday." Parts of those interviews will also be "spread around" to "Nightline" and "Good Morning America" too. America can't get enough of Governor Palin. 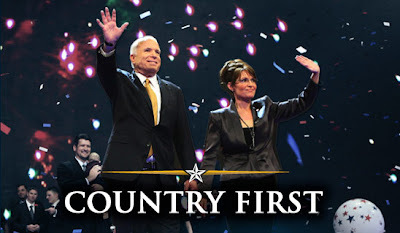 Don't forget that John McCain made the decision to select Palin as his running mate. A choice that stands in stark contrast to Barack Obama's selection of Joe Biden - Biden who today admitted that he might not have been the best pick for VP. Biden said, "Hillary Clinton is as qualified or more qualified than I am to be vice president . 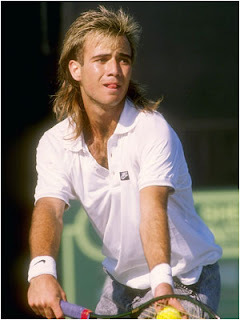 . . it might have been a better pick than me." 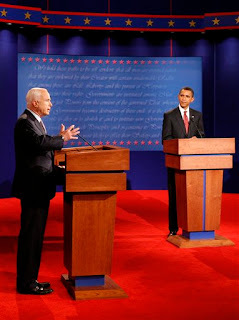 In choosing their running mates (the first truly executive decisions made by either presidential candidate), McCain hit a home run and Obama struck out. Here they come . 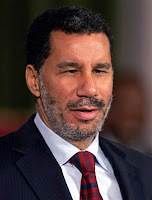 . . the allegations of racism are on their way, beginning today with New York governor David Paterson arguing that Sarah Palin referring to Barack Obama's experience as a "community organizer" was "code" for calling Obama "black." Paterson explained, "I think where there are overtones is when there are uses of language that are designed to inhibit other people's progress with a subtle reference to their race." Paterson gives Republicans credit for their intelligence. He says that the GOP "is too smart to call Barack Obama 'black' in a sense that it would be a negative" so instead they call him a "community organizer," which, of course, means black. Then those racist Republicans "kept saying it [and] they kept laughing." Why is it racist to refer to a candidate as a "community organizer" when, in fact, he was? And why is it okay for The Nation or U.S. News & World Report to refer to Obama as a "community organizer" but when Sarah Palin did it it was obviously a veiled reference to his race? It is not, by any means, racist to quote a man's resume. 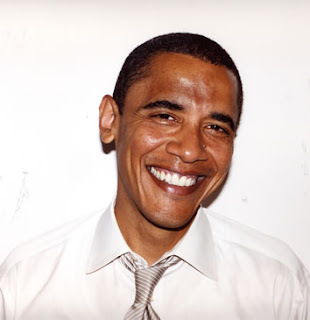 And, by the way, is there anyone on the planet who doesn't already know that Barack Obama is black? Even if the Republican National Convention was the political equivalent of a Klan meeting, which apparently the governor of New York believes, why would Sarah Palin need tell anybody there about Obama's race? Without grounds, Governor Paterson and the rest of our friends on the left should keep their accusations to themselves. I can't believe I'm doing this but . . .
here's a link to a column by Camille Paglia at salon.com. Sarah Palin has even won ultra-liberal Paglia's respect and even admiration. From the Big Fat Who Cares Department . . .
the British Broadcasting Company has conducted a poll that found people in Australia, Brazil, China, Egypt, France, Germany, India, Indonesia, Italy, Kenya, Lebanon, Mexico, Nigeria, Panama, the Philippines, Poland, Russia, Singapore, Turkey, the United Arab Emirates, and the UK all prefer Barack Obama over John McCain for President of the United States. First of all . . . WHO CARES! Second, do you think that some of these foreign folks might actually prefer Obama because his presidency would create a weaker America, which would be in their own countries' perceived best political or economic interests? John McCain . . . Country First! One major reason that I supported Kenny Hulshof in the Republican primary for governor is that he supports tort reform and his opponent did not. But Missouri trial lawyers' support for Sarah Steelman's campaign was only lukewarm compared to their current support for Democrat Jay Nixon. And trial attorneys are sending Nixon more than moral support. They are filling his campaign coffers at a tremendous rate. According to an article from Tony Messenger in today's St. Louis Post-Dispatch, "a look at Nixon's big-money donors starts and ends with Missouri's big-name lawyers, specifically personal injury attorneys." Nixon's supporters are the folks who file lawsuits for injured people (or for uninjured people claiming to be injured). Some, indeed, are advocates for the downtrodden little guy but a good many are slick ambulance-chasers out to get their one-third contingency fee off of the top of the biggest and most settlements they can get. These lawyers' bottom lines have been affected by common sense legislation passed by the Republican-led Missouri legislature and signed into law by Governor Matt Blunt in 2005. This legislation - now law - is commonly referred to as tort reform. Tort reform put an end to personal injury lawyers shopping around for the most liberal forum in which to file their lawsuits (the City of St. Louis was a favorite) and now requires all tort suits to be filed where the alleged injury happened. Tort reform prevents a defendant who is only minimally responsible for causing an injury from having to pay an entire judgment, just because that defendant has deeper pockets than the one who was more responsible for the injury. Tort reform limits requires a correlation between the amount of actual damages in a case and the amount of punitive damages that can be awarded. Tort reform brings evidence of money actually paid to healthcare providers, instead of amounts billed but written off. Tort reform allows people accused of causing harm to express natural human sympathy to a victim or the victim's family without their words being construed as an admission of guilt or responsibility. 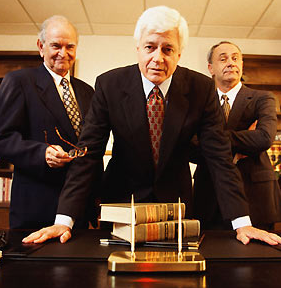 Tort reform evened the playing field between plaintiffs and defendants in civil litigation. The trial lawyers are funding Jay Nixon in the hope of getting some of their old advantages back. To keep the courtrooms fair, Kenny Hulshof needs your vote in November. 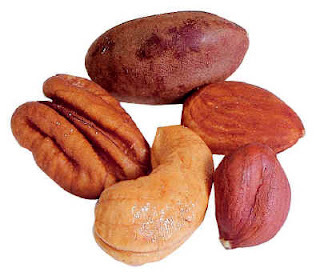 Keep Global Warming Nuts out of my Dining Room! Liberals are keen to keep government out of the bedroom but conservatives and all friends of personal liberty had better stand up to keep the government out of our kitchens, dining rooms, and drive-through windows. The environmentalists are at it again, now led by Dr. Rajendra Pachauri, chairman of the U.N. Intergovernmental Panel on Climate Change, who wants to save the planet from global warming by turning us all into vegetarians. Meat production, you see, produces methane (via gassy animals), which is a "greenhouse gas" said to be 23 times worse than carbon monoxide. Right now, Pachauri is only "suggesting" one meat-free day each week, but that is only the beginning. He wants us all to then "decrease it from there." As a mere suggestion, this is no big deal, but here's the scary part . . . advocacy groups are calling "for governments to lead campaigns to reduce meat consumption by 60 percent by 2020." We don't need the government campaigning for and eventually mandating vegetarianism. This is still America - let's keep it that way! Dr. Pachauri's background is interesting and worth knowing . 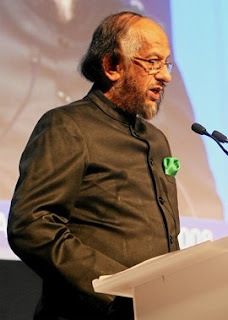 . .
You might think that as the head of the Intergovernmental Panel on Climate Change Pachauri's doctorate would be in planetary or some physical science, right? Nope. It's in economics. And, here's the most interesting part of his background in the context of advocating vegetarianism . . . he's a Hindu and already practices vegetarianism for religious reasons. Is there some covert proselytizing going on here? Since the Republican National Convention, polls are showing a new leader in the race for the White House . . .
USA Today/Gallup shows McCain-Palin leading Obama-Biden by four points among registered voters and TEN points among likely voters. And Gallup's daily tracking poll has McCain up by three. See what happens when a conservative with executive experience and a personality joins the ticket. 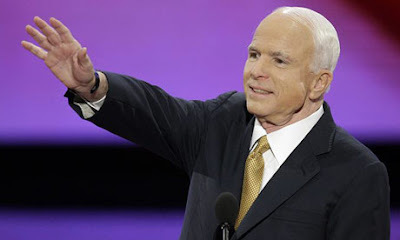 John McCain's speech tonight accepting the Republican nomination for president did not elevate him to the lofty post of the Saint Louis Conservative's favorite politician. But it did convince me that I don't need to hold my nose quite so tightly when I vote for him in November. I still have real problems with McCain on some of his domestic policy points and I'm not sure that he is truly conservative. 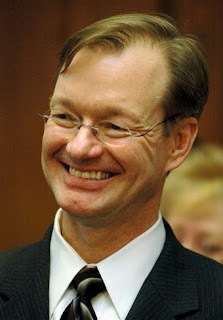 I remain worried about the type of judge that he might appoint to the federal courts, including the Supreme Court, but I must admit that he hit the conservative bulls-eye with the first appointed position he filled. And since Barack Obama agrees with McCain on the things that I disagree with him about, those issues are a wash.
What McCain said tonight that brought me over to his side was his personal story about what our great country meant to him. Looking to the American people, McCain made a solemn vow. "My country saved me," he said, "and I will fight for her as long as I draw breath so help me God." I believe him. And I believe that McCain is the man to to continue the fight for America in this dangerous world. Sample Reaction to "The Speech"
"Sarah Palin's sensational performance at the Republican Party Convention may turn out to be the tipping point of this rollercoaster American election. Obama fans hoping she would fluff her big night were in for a nasty shock. This speech has turned the election upside down. It was simply stunning." Ever since George H.W. 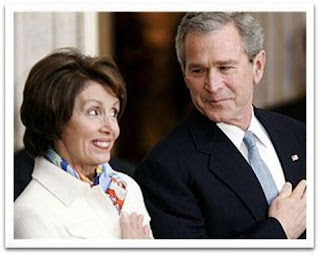 Bush sucker-punched the conservative movement by breaking his "no new taxes" pledge, I've been hoping for a leader to emerge and put us back on track. Presidential candidates have come and gone. They and many others have emerged but they all failed. They either compromised their conservative principles or lacked the spark necessary to lead. But now I believe that John McCain has found the leader that I've been hoping for . 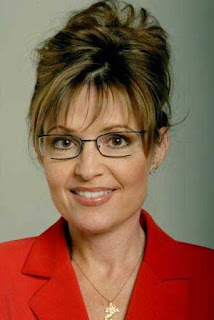 . . and her name is Sarah Palin. This bulldog - or maybe a Malamute - from Wasilla, Alaska, "rocked the house" with a speech at the Republican National Convention that even the Associated Press had to call "star-turning." Governor Palin's speech had many highlights. Here are three of my favorites . . . In comparing her experience to that of Barack Obama, Palin said, "I guess that a small town mayor is sort of like a community organizer - except that you have actual responsibilities." 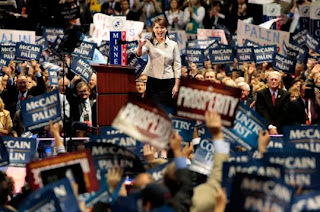 Spelling out "the right reason" to go to Washington, Palin said it "is to challenge the status quo, to serve the common good, and to leave this nation better than we found it." And describing what voters face this November, Palin said, "here's how I look at the choice Americans face in this election: in politics there are some candidates who use change to promote their careers, and then there are those like John McCain who use their careers to promote change." I had only one problem with last night's speech - it ran long and my DVR cut off the end of it. So you, like me, can read the text here. Last night my new favorite politician asked last night for all of us to the McCain-Palin cause. Consider it done Governor. 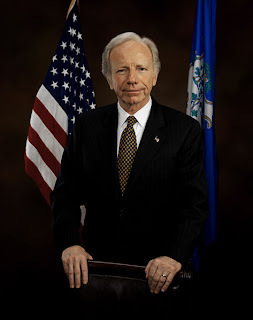 It is no secret that Connecticut Democrat Joe Lieberman is a supporter of John McCain for president. In fact, some thought he would get the V.P. nod. I'm thankful that he didn't but I was happy to see him reach out to fellow Democrats in support of McCain's candidacy tonight. It is remarkable and newsworthy that a sitting U.S. Senator and former nominee of the Democrats for the vice-presidency appeared at a Republican convention and endorsed the Republican ticket. And, I think that Lieberman means what he said tonight. He believes that this country is more important than partisan politics and also believes that his friend, John McCain, is the right man to lead it. Lieberman gave the reasons that he's backing the GOP in November. I want to note two . 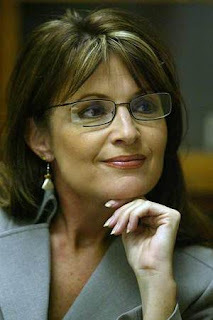 . .
First, in speaking of Sarah Palin, Lieberman said that she "like John McCain is a reformer. She's taken on the special interests and the political power brokers in Alaska and reached across party lines to get things done. The truth is she is a leader we can count on to help John shake up Washington. That's why I believe that the real ticket for change this year is the McCain-Palin ticket." While it may be unlikely that any politician will really change the way that business is done in the capitol, I know that there's no chance that Barack Obama will. He's just beholden to different special interests than the current administration is. With Palin prodding and McCain's own "maverick" tendencies, he might just try. Second, Liberman stated that "John McCain will be a president our allies will trust and our enemies will fear. And that's the kind of president we need in today's world." I couldn't agree more. On foreign policy, there is no contest between McCain and Obama. McCain wins that issue in a landslide. Instead of inspiring trust in our allies, Obama promises only wide-eyed idol worship, with no substance. And instead of inspiring fear in our enemies, Obama will inspire hope - hope that America will back away defeated from the fight before it is finished. I disagree with John McCain on many issues but American needs him now. The alternative is disaster. Even Joe Lieberman knows that. If John McCain is elected president and Sarah Palin vice-president in November, come January McCain will be addressed as Mr. President and Palin will be Madam Vice-President. But I suspect that she will prefer the title she'll receive this December even more . . . "Grandma." Palin's daughter Bristol (shown here holding her 5-month-old brother Trig) is pregnant. Yes, she's only 17. No, she's not married. Yes, she and her boyfriend made a mistake and engaged in activity with this possible result before they were married. But mistakes happen. Life happens. What matters his how people deal with those mistakes. And it seems that Bristol, her boyfriend, and the entire Palin family are handling this pregnancy perfectly, with "unconditional love and support." The Palins seem to understand that this child is a gift from God. Thankfully, this child is coming into a family that believes in the sanctity of life. I hate to think about what might have happened if such a "scandal" arose in the family of a "Pro-Choice" politician. Sarah and Todd Palin are "proud of Bristol's decision to have her baby." They should be. In that respect, they raised her right. Bristol and the baby's father plan to marry. Good for them. I remember when my wife and I first told our parents that we were expecting a baby. And I remember when the baby was born. I remember the looks on the grandparents' faces and I could feel the joy in their hearts. If McCain and Palin win this election, the VP-to-be may think that she's happy this November but those feelings will shrink to nothing when she becomes Grandma Vice President in November. And if they lose in November, Governor Palin may be sad for a while but come December, it won't seem to matter anymore.